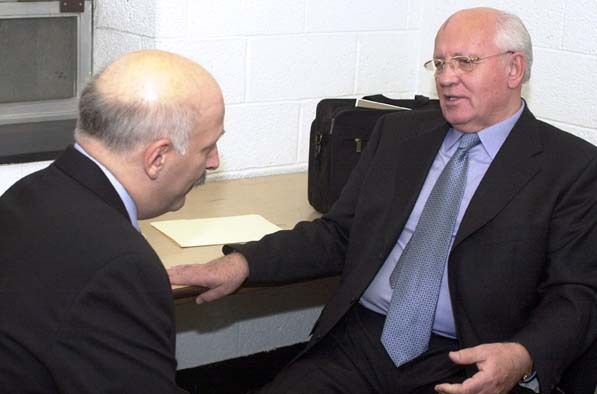 Golden interviewed former Soviet leader Mikhail Gorbachev for his most recently completed book, O Powerful Western Star, a history of the Cold War. Golden spoke with Chancellor Joel Klein at the Harvard Club in New York City. Golden believes Klein will prove to be one of the most significant educational reformers in the history of American public education. Twenty years ago, Golden had interviewed Elie Wiesel by phone, and Wiesel later wrote a very kind review of Golden’s Quiet Diplomat, but this was the first time Golden had a chance to speak with the Nobel Laureate in person. Prime Minister Yitzhak Rabin and Max M. Fisher. Fisher was among the most notable back-door diplomats of the 20th century. Golden wrote his biography, and upon the occasion of the publication of the Hebrew translation, Rabin gave a lecture on the book. Of all the world leaders Golden interviewed, Rabin had the most varied career, and he gave him the most time, well over two hours. A decade after Golden first interviewed Richie Havens, and thirty-five years after he first saw him at Carnegie Hall, his son took this picture in Homer, New York, October 15, 2005. During an interview, Golden made a few requests for the upcoming concert. Mary Travers was impressed that the writer knew some of her less, well-known songs. However, Ms. Travers was not impressed enough to sing any of them at her performance. Here are some audio (.mp3) excerpts from some of my interviews with world leaders.